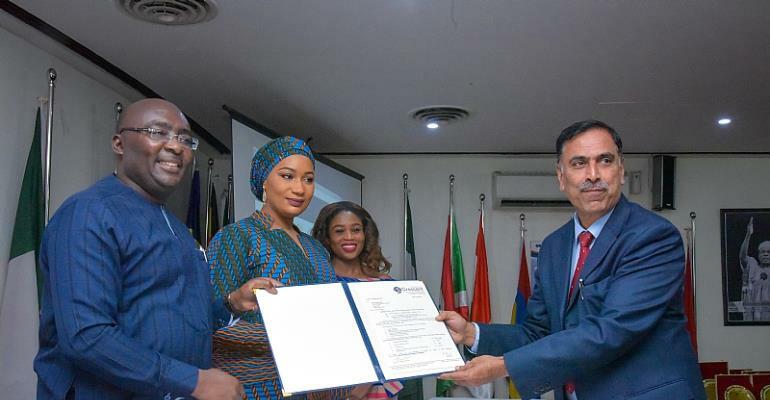 Second Lady of Ghana, Hajia Mrs. Samira Bawumia, through her not-for-profit organization, the Samira Empowerment and Humanitarian Projects (SEHP), has secured twelve (12) scholarships and free services for children needing special pediatric care abroad. A number of qualified Ghanaian students are set to enjoy partial and full scholarships in two Indian Universities. Health professionals are also set to receive training to improve their skills, while paediatric patients recommended for treatment abroad are to benefit from free health care in a leading Indian Teaching Hospital. Ghana’s High Commissioner to India, H.E. Michael Aaron N. N. Oquaye (Jnr), made the announcement in New Delhi, India on Monday, 18th March, 2019 at an event organised by the Delhi Chapter of the Global Organisation of People of Indian Origin (GIPIO) in collaboration with the Samira Empowerment & Humanitarian Projects (SEHP). At a brief ceremony ahead of the programme; witnessed by the Vice President of the Republic, Dr. Mahamudu Bawumia, and the Second Lady, Mrs Samira Bawumia, H.E. Oquaye revealed that Parul University is offering two (2) full scholarships, catering for tuition and boarding, to qualified Ghanaian applicants, while Crescent University is offering 10 partial PhD scholarships to deserving students. H.E. Oquaye expressed the appreciation of the Ghana Government for the opportunity to give further training to qualified Ghanaians, saying it is a reflection of the deep bonds of friendship between Ghana and India. Mrs. Bawumia is in India with H.E Dr. Alhaji Mahamudu Bawumia, for the 14th CII Exim Bank Conclave on India-Africa Partnership Project.